Description: One of three anti-Lincoln satires published by Nichols in Boston at around the same time. (It was deposited for copyright on June 30, 1863, along with “Oppression!! Suppressing the Press” and “The Great American What Is It? Chased by Copper-heads” nos. 1863-6 and 1863-8). 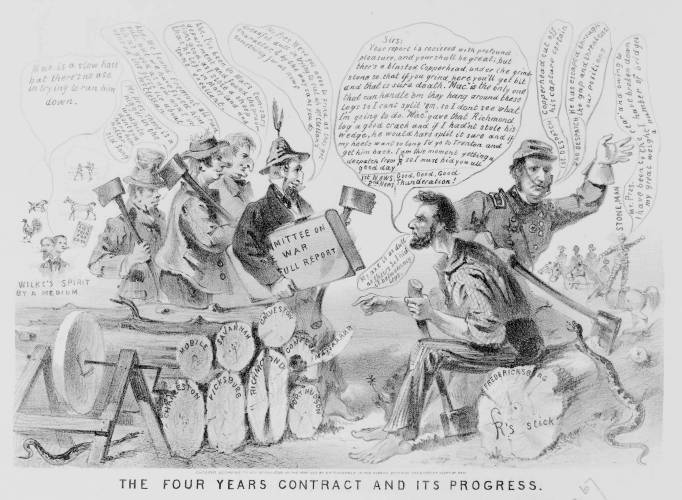 The present cartoon criticizes the Lincoln administration’s mismanagement of the war, the “Four Years Contract” being the presidency. A barefoot Lincoln sits on a log labeled “Fredericksburg” (site of a major Union defeat under the leadership of Gen. Ambrose E. Burnside) and holds an ax between his legs, as he receives four members of the “Committee on War” at left, who also carry axes. Second man: “Abe., We found Fremont [Union Officer John C. Fremont] all run out, but we have fixed him up as good as new and I invented the first lie about McClellan.” In 1862 Gen. George B. McClellan was relieved from command of the Army of the Potomac (some said for political reasons) and later became the presidential candidate of the Peace Democrats. The term “Copperhead” referred to Peace Democrats and others who advocated a negotiated reconciliation with the South. In the right background, “Stone-Man” a figure made of stones standing on a horse, comments, “Mr. Pres. I have been to the rear and owing to my great weight I have broken down a number of bridges.” The figure no doubt represents Gen. John Stonemen, commander of Union cavalry during the recent defeat at Chancellorsville.